Out of Area 51 on up to Elko. Might be holed up here for the start of 2018. We got out of AR51 with no added problems, and headed to KEKO Elko, NV. 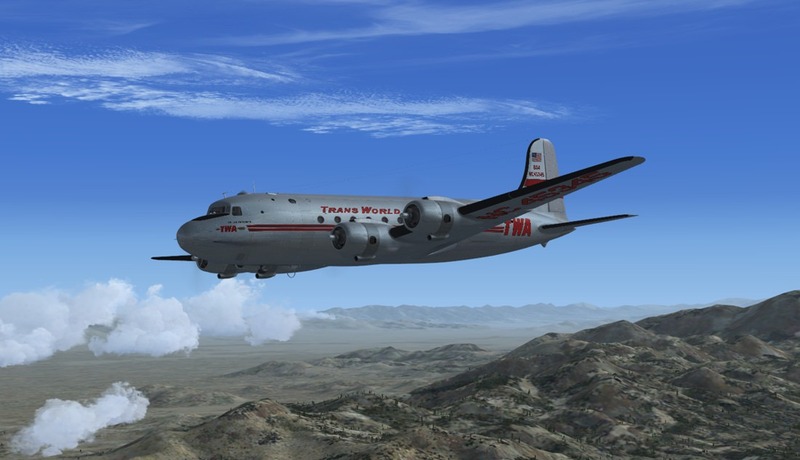 Nice flight, with the exception of my continued flight with the Auto/pilot on this DC-4. Picture, DC-4 in front of a very large hanger. 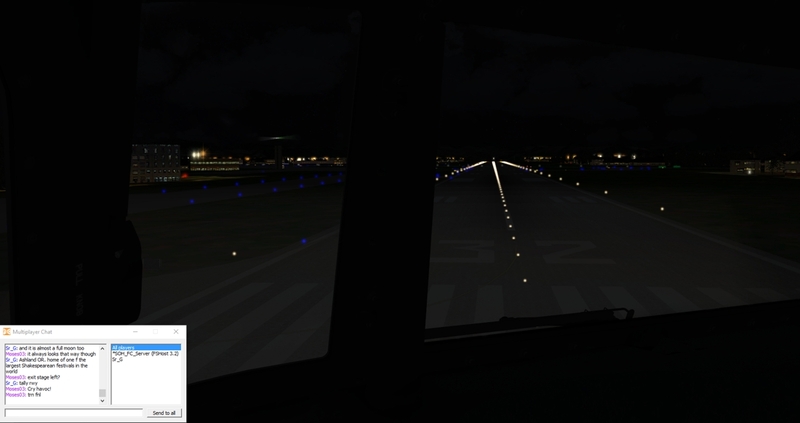 After awhile when it started to get dark, I started to worry if KEKO had runway lights! In the rush to get out of AR51 I forgot, my bad. Picture, the 4 flying at dusk. Well, you more than likely you all know we made it out of AR51 with all body parts still in tack. The flight decided to starting with Saturday we would take the holiday off and do some R&R until 2018 hehe. Going to try and catch some of the local airlines and head for home to be with the families. What T said. See yall next year! Into Medford, Oregon. Rob and I followed the valley right on in. Jim stayed behind to go find a fan belt. Last edited by Moses03; January 3rd, 2018 at 06:53. Into Medford, Oregon. Rob and I followed the valley right on it. I thought I heard you guys fly by today. Well, this evening. Good flights to you, and a great 2018. Now let's see how many checks you all have to tear up for filling in 2017. Not that I would ever do that. Nope. Not me. Never ever! PS: I'm just west of 2S7, smack 'tween KLMT and Crater Lake. I came across HARS (an Australian aircraft restoration society likes the CAF) trying to get this B-29 back to Australia from the Mojave. The FAA wouldn't let them fly it out, they found a loop hole and were able to fly it in civilian guise. I caught a ride with them to LAX. In LAX I was able to get myself back in a DC-6. A Late afternoon flight up back up to Fresno. I called in a favor from Thunder City. I approached Groom Lake low and fast. Aiming for a high speed run down the main runway... hope I didn't break too many windows. Like a street racer on a Friday night I felt the need to show up the locals... mines faster than yours. A mach 2 run up to 83,000 feet and glided back to the runway at groom lake for a brake parachute assisted landing. Obtained permission from the base commander to have my Dc-6 flown up. Very early morning Departure for KEKO. Feeling lazy, I elected for an easy flight tonight with lots of autopilot and Lnav. Absolutely appalling visibility into KMFR, an ILS approach into RW14 was made... and I may or may not have broken the flaps again, hence the 115kt approach speed. We had a couple days when there was a pogonip (look it up. Really cool, pun intended), that lasted all day. Unusual but not unheard of. I love fog, having grown up in the San Francisco area. Not great for landings, granted, but really nice in the evening on a outdoor restaurant's table. You can watch it roll up the mountains, and all of a sudden, you are the only one's in the area, it feels like. Nice candle on the table, and you can see your partner, but that's all. It's really very romantic. You gents are welcome to join us anytime. We usually start gathering up around 9pm CST and fly for about an hour or so. I know the time difference could be a challenge though, especially for PM. Hope to see you all sometime (or anyone else who wants to do a little online flying fun). Would love to, unfortunately 9pm CST works out to be 11am AEST. I will have a try this Saturday (Fri pm us time) for the group flight. Its been about 5 years... maybe more have to remember how to do it! Thanks for the warm invitation, always enjoyed the flight 19 adventures. A slight detour over Crater Lake on the way to Portland. Nice flight from Medford to Portland. On short final had to hold altitude as there was something stuck in the grass just before the threshold. Leared it and we all got safely parked eventually, with Mt. Hood on the horizon. As noted we were heading to KPDX, Portland, Ore. We took a side trip over Mt Pit on our way to Crater Lake, and then on to Portland. We saw some pretty country and we passed the Three Sister Mountains, which are kind of land mark for early traveler. Hehe, and then we flew into the Willamette Valley, and we passed the city of Eugene, and we all made some comments that it was strange name for a City. 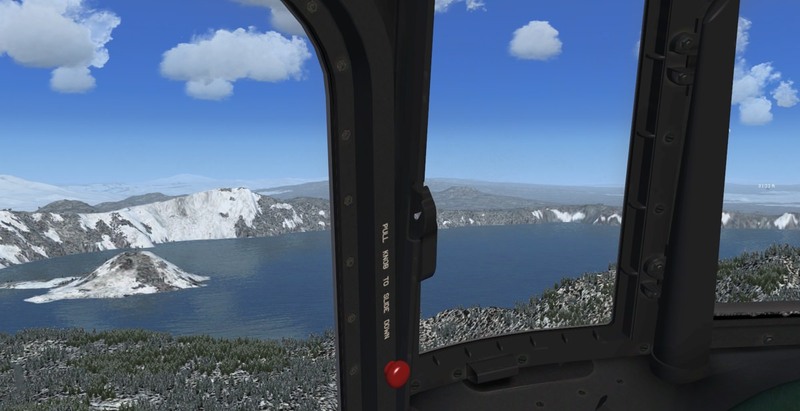 Everybody made into KPDX OK. Picture, got a little low over Crater Lake, Not by choice we must have ran into an down draft we added a little power, hehe, full throttle, and just skim over the cliffs that surrounds Crater Lake. That place requires a snowmobile or horse drawn sleigh to visit come winter. They measure their snowfall in feet, not inches. Heck, there have been times the road crew could only dig tunnels through the snow, not clear the roads. Amazing. Thanks again, both for the great, GREAT pictures, and the invite. Keep up the wonderful, fun flights! Had some issues with the Canadian customs in Vancouver and headed back south to Seattle and landed at Boeing Field there. We had a chili cook off and apparently the Boxcar was a bit too "gaseous" and "odoriferous" for the customs agents. So, I'll hang out here until the guys head this way after leaving Canada. KMFR - FPDX: Hauled 28,000lbs of freight up to KPDX in a 6A freighter that I swapped my 6B for. Flew in between 2 cloud layers between fl080 and fl100. Weather hasn't been kind up the north west, I've been struggling with icing and oil pressure. Requires constant monitoring as the FLT ENG doesn't seem too attentive. KPDX- CYYJ: I Wondered why mid flight my FPS dropped off (solid cloud layer from fl020 to fl110) until I saw Mt Rainier in the distance. Seattle not to kind on the ol FPS. Visibility into CYYJ was again terrible had to make an ILS approach.